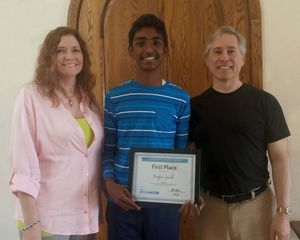 CUPERTINO, CA--(Marketwired - May 27, 2015) - Bob Zeidman is proud to announce the six winners of the first annual Zeidman Awards, a program established to recognize middle school students in the fields of electrical engineering or computer science who demonstrate an advanced knowledge of electronics or computer programming to solve challenges in a unique and efficient manner. The awards were presented during the 15th Synopsys Science & Technology Championship at the San Jose McEnery Convention Center. Earlier this year, more than 900 middle and high school students from across Santa Clara County convened at the event to display their research projects. This was the inaugural year for the Zeidman Awards, created by engineer-scientist-entrepreneur Bob Zeidman. After reviewing presentations and interviewing students, a panel of 25 judges selected finalists from among 122 eligible projects. Zeidman conducted interviews with each finalist before determining the winners. "All of the students were excited, knowledgeable, and articulate. Although just six received awards this year, the large number of entries should give us hope about the future of science and technology in America," said Bob Zeidman. "Congratulations to these exceptional young people. Your rewards were well deserved, and we look forward to watching your trajectories in the decades to come." Bob Zeidman is an inventor and entrepreneur whose ventures include Zeidman Consulting, Zeidman Technologies, Software Analysis and Forensic Engineering, Z Enterprises, SamAnna Designs, and Swiss Creek Publications. Bob holds numerous patents and earned degrees in physics and electrical engineering from Cornell University and Stanford University.